Where the Yarra weaves around the south side of Herring Island, Kanteen sits atop the bank, making the best possible use out of a former toilet block. Perched above the Capital City Trail bike path it is popular with bi-pedalers for breakfast; on this windy Tuesday afternoon, however, a near-full house showed its appeal goes beyond eager weekend exercisers. The breakfast menu, strong on eggs, runs until 3pm. In addition, from 11am, there is a tempting selection of pides, a pair of salads and a daily special (in this case a ravishing-sounding Thai pumpkin soup with crusty bread). We went with one dish from each section. From the breakfast menu, a humble melt showcased how quality ingredients can lift something straightforward to something wonderful. The fresh rye bread sponged up the flavours it supported; namely finely-sliced, smoky ham, juicy red tomato and a light melted cheese. The dish was small in size but strong on quality, with the sum of its parts adding up to a satisfying whole. 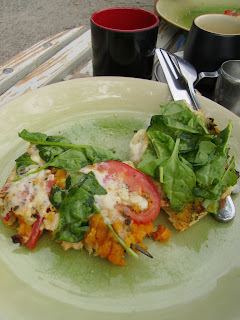 The mediterranean pide had a list of fillings I couldn't go past: I was already sold by the time I'd read pesto and artichoke, but it went on further to note both sweet potato and pumpkin, roast capsicum, spinach leaves and cheese. 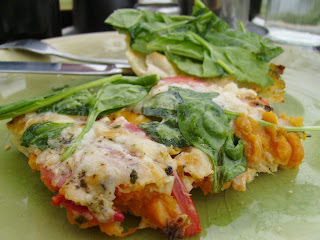 The dish didn't disappoint, though nor did it break any new ground. With the duo of roasted orange veg, the filling was pliant to say the least, and would perhaps have been bettered served with rocket or similarly crunchy greenery. The artichokes really came through though, lifting the flavour milieu with their nutty saltiness. Kanteen is also known for good coffee. 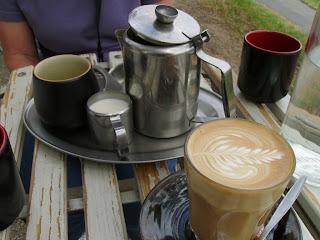 The menu states pointedly that they serve their coffee tepid, as this is best for preserving the creaminess of the milk. My latte was certainly made with care, with a good consistency crema. I admit to being a fan of my coffee hot, rather than tepid (and one can ask for them to 'burn the milk' for a hot coffee) but the temperature of this one as it was served was quite adequate. Tea was a user-friendly affair: a tray of implements to let the fussiest of drinkers control their tanniny tipple, made all the more enjoyable by some very ergonomic Japanese tea cups. Toilet blocks are not, as a rule, known for being landscape-dominating buildings. 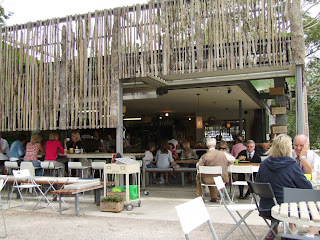 With this refit, Kanteen's owners have retained subtlety and, particularly sitting outside, the feel is almost of a picnic ground, as the tables space themselves around gum trees. Both our meals were served on attractive olive green plates that were an exceptional complement to the surroundings. Kanteen is also significant as one of the few venues able to nudge the Citylink out of the way and establish comfortable riverside eating.